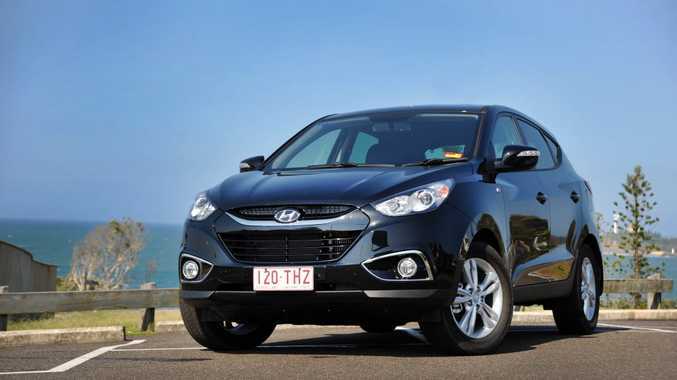 LET us introduce you to our new long-term test vehicle: a Hyundai ix35 CRDi SE. Over the next six months we'll be living with the popular Korean compact SUV, comprehensively evaluating the vehicle Hyundai calls its game changer. Usually our reviews are based on a first drive at a car launch, a weekend test or a week-long test. While these are excellent introductions to a vehicle, a six-month test allows us to learn what a car is really like to live with in all manner of conditions over an extended period. It will endure smooth bitumen, dirt tracks, off-road routes, country lanes and city streets; it will face extremes of heat and monsoonal rains; it will carry the family shopping, child seats, sports equipment and a vast array of passengers. A six-month test will reveal the ix35's strengths and weaknesses, its abilities and limitations and perhaps even the odd thing that goes wrong. Our variant - the CRDi SE - is a relevant model for modern Australian life. It features a 2.0-litre common-rail turbo-diesel engine good for 135kW and 392Nm, a six-speed automatic gearbox and electronically controlled on-demand all-wheel drive. Hyundai quotes that it will return us an average of 7.5-litres per 100km, and pump out 198g/km of CO2 gas. This model is the European-built SE ix35, shipped in to satisfy our market's high demand for the model, and reflecting how Hyundai, like most other car makers, is currently struggling to shift new cars in Europe. Hyundai sells its ix35 in three different equipment specifications: the entry-level Active, the mid-range Elite, and the range-topping Highlander. We're in the less- luxuriously equipped and cheaper Active, but as it is the Special Edition (SE) model it adds appreciated upgrades to an already quite generous spec. The ix35 Active comes with a 12.7cm touch screen radio; an iPod compatible, AUX and USB-equipped entertainment system, Bluetooth, cruise control, Downhill Brake Control, Hill Start Assist, reverse parking sensors and an advanced stability control system. The SE part adds 17-inch alloys, an electrochromatic mirror with rear- view camera display, leather/ leatherette seats and electric folding side mirrors. It's going to be a busy first few weeks for our ix35, with a child seat about to be installed and its first demand as transporter for two road bikes in the pipeline. We'll be doing regular reports on the Hyundai to see if it rightly deserves its place as one of Australia's most popular and highest- selling compact SUVs. Model: Hyundai ix35 CRDi SE. Details: Five-door all-wheel-drive compact SUV. Engine: 2.0-litre four-cylinder turbo-diesel generating maximum power of 135kW @ 4000rpm and 392Nm @ 1800-2500rpm. Transmission: Six-speed automatic with electronic sequential manual mode. Consumption: 7.5 litres/100km (combined average). Bottom line: $35,990 drive away.